Today I'm sharing an alcohol ink landscape. 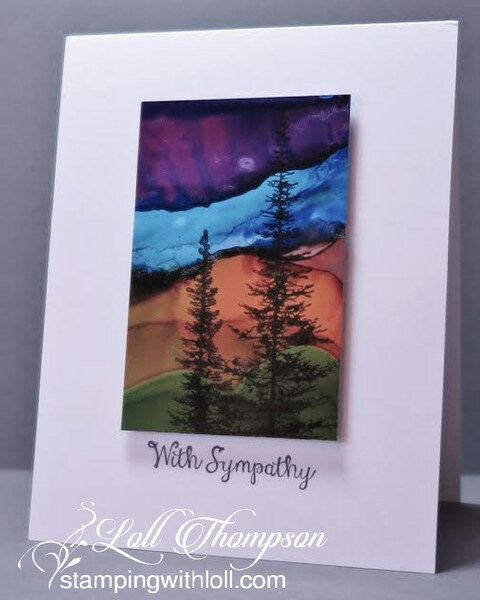 This card was sent to dear friends who are dealing with a tragic loss in their family. I hope that my card and words of support gave them some comfort. I have been having some success working with alcohol inks lately. This time I used Yupo paper and tried to create layers of colours to mimic a sunset. Not sure I succeeded, but I am happy with how this turned out. This is gorgeous Loll, I love the background colours. I love the background colours, A really beautiful card, which I am sure will be well received. This is absolutely stunning, Loll. WOW! Look at what you did! This is a beautiful landscape, Loll! And the trees are perfect against it! WOW! Loll, this is breath taking. You are a master of alcohol inking. I'd say you did MUCH better than winging it! These vibrant colors are just gorgeous, Loll! What a beautiful landscape and what an outstanding job on a difficult technique! Very nice Loll! You captured the sunset beautifully. I'm enjoying looking at your past cards. Thanks for sharing. My first response was "oooooooo". This is amazing, Loll. I don't know what else to say. I'm sorry for the pain that your friends are going through, but this card is sure to give them comfort. It's truly beautiful. Would love to see a video of you creating with your Alcohol inks. While you can't ever get the same thing twice, it would be fun to watch how you go about it. This is truly a work of art Loll! This is very pretty and a technique I am going to have to try! Breathtakingly stunning, Loll! that is all I have to say!! except...can I come play with you? *wink!! A beautiful landscape and wonderful colours! Beautiful!! You create amazing things with alcohol inks!! What a beautiful and somber card. The colors reflect the mood of the sympathy card. Heartfelt care and concern during a dark and difficult time. Thank you for sharing. I wish the family with the loss peace and comfort. Love the sky effect you created, Loll - it's just gorgeous! I have had such fun making backgrounds with your alcohol ink techniques and now here is a new idea!! Thanks for all the inspiration, and Happy New Year!! Gorgeous as always Loll. Itching for the Yupo!! But it's on it's way!!!!! WOW, wow, wow, Loll!!!!!!!!! This is a small work of art and fit to hang against any gallery wall!!!! Oh, boy, I LOVE it!!!! I can just sit and stare at it the whole night and wish I could make something like that!!!! Fantastic, my friend and surely your friends loved it too, and it has given them some comfort!!!!! ...and now I have to pick up my jaw from the ground to continue my journey through Blogland!!!!! Your work is always so inspiring!!!! PS. Thanks so much for popping in at my blog and leaving sweet comments - so much appreciated!!!!! All of the best for 2017 to you!!!! Beautiful landscape you created there! I haven't played too much with Yupo paper and alcohol inks but it's hard for me to imagine having any kind of control of the outcome! You sold me on Yupo which arrived today via Amazon, along with some Zig markers. Oh boy I am really a pathetic cardmaking shopoholic. Hope Darnell has her NBUS blog hop soon. In my thoughts, Barb. Hi Marcia. You can use waterbased inks on Yupo, but you have to let it dry a long time ... at least overnight or maybe longer. So sorry to hear of your friend's tragic loss; I'm sure this card will bring them some comfort. What a lovely design, and you seem to have mastered the technique! On my list of things to try this year. Sending hugs! Gorgeous sympathy card, Loll, and perfect for the recipient. Reminds me of the colors of Sedona and the Grand Canyon. I love your artwork and follow you pots this very minute!